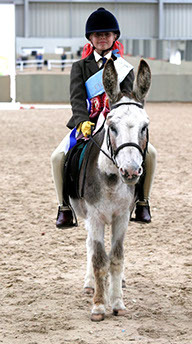 We have a series of awards designed to assess practical knowledge of donkey care and management, ranging from an Introductory Test which can be taken in stages from six years of age up to seventeen years. Certificates and themed badges are awarded at the conclusion of each stage. There are Calpurnia Trophies which are awarded in the regions and a National award called the Barnabas Trophy is awarded to one junior, nominated by adults, for exceptional contribution in one year. 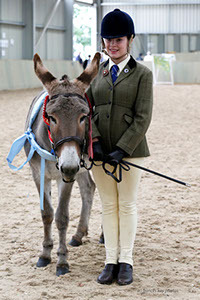 This is a scheme where you can enrol and log your riding hours for rosette rewards. There is a similar scheme for driving miles which can be accessed from the Driving Page. 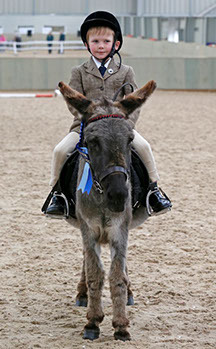 The Donkey Breed Society encourages Junior members to consider the best ways to meet the needs of their donkeys through active participation in a range of user friendly staged management accolades (DBS Proficiency Awards). 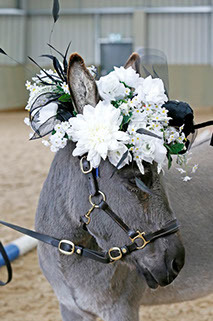 These have evolved to meet the needs of Junior members, starting in simple terms with how to approach and handle your donkey through to the complexities of case studies, stallion management, breeding, feeding and health requirements in the gold award. Anyone wishing to apply for the gold award scheme should contact the E&Y Committee Chairman.